As years go by, farmers have discovered the best ways to rear chicken. As more people decide to engage in poultry farming, more technological developments continue changing as time goes by. Decades ago, candlers were used to check the progress of egg development. However, today, that practice has been washed out by the invented technological methods of monitoring the growth of your eggs. People are now looking or the best egg candler available. You will no longer have to drill through holes to view the eggs progress; the best egg candler will make your egg candling experience exciting! Get ready to learn the new technology in egg candling, and the best ways to use an egg candler. Egg candling is an essential process during hatching. It shows you if the egg’s embryo is developing in the right way or, it is not, so you have to remove it. In simple words, it is checking the hatchability of an egg. With no egg candler, you are probably waiting for results that will never come out. Imagine wasting all that time and money hoping and waiting for something that is not there yet there are ways you can use to remove all the doubts. Getting disappointing results is very discouraging and heartbreaking. It is so sad to start a whole process over and over again, especially when it costs so much. This may not have happened to you as an individual farmer, but you can confirm with confidence that it does happen. It happens when you least expect, and it can happen when you have no alternative to turn to. How to use egg candlers? We can refer back to the olden days when we still used a candle for egg candling. To start you off, you will need an egg and a source of light. Often, light bulbs are the go-to in egg candling, but we have a particular type of bulb that is used for this kind of job. The LED egg candling bulb, apart from offering a light source, they provide a steady positioning of the egg. However, it is okay to use a flashlight if you wish. The following steps will show you how to use an egg candler. First, position the egg directly from the light source. The bulb, or in case of a flashlight, you will only need to switch it once the egg is in position. If you are using a torch the hole should be enough to hold an egg. However, you can choose to hold the egg yourself; it is also okay. This process should take place in a dark room for the best results. Switch on the light directing through the egg. You must be able to see through the egg and determine whether the embryo is developing or it’s not. If you don’t see anything keep turning the egg until you see something. If you don’t see anything, then there is a problem. If the egg has a healthy embryo, you should be able to see a spot like in the egg with vein-like branches originating from it. The embryo might not have developed well, unfortunately. To know this, you will see a ring of blood around the egg. This calls for the alarm to remove the egg immediately. If you see nothing, then this means that the egg is infertile and there is no embryo. At this stage, the spot should have grown larger, this means the embryo is developing. If you see a blood ring round the egg, then the embryo did not survive, and you need to remove it. At this stage, most eggs will have grown darker. You should still be able to see the veins and the large spot. The embryo has now grown near completion. Any bad smell or blood ring round the egg, calls for the alarm to remove the egg. What should you consider before buying an egg candler? The egg candler you buy will greatly affect the success in testing the hatchability of your eggs. It is advised that you should avoid buying light sources that produce a lot of heat because this encourages egg spoiling. You should buy a source of light that produces cool light, that is enough and efficient, and will enable you to see through all eggs even the thick-shelled ones. What is the best egg candler in the market today? Magicfly Bright Cool LED Light Egg Candler Tester-Incubator Warehouse Exclusive. This egg candler is pocket-friendly, it is safe to use and comes fitted with a high lumen and cool lighting source safe for brown eggs. Using this egg candler, you can see you eggs embryo when manifested with veins connected from it spreading out. Magicfly Bright Cool LED Light Egg Candler Tester-Incubator Warehouse Exclusive its main use is for egg incubation. However, you can still use it for tutorials is schools’ laboratories. Brinsea Products Candling Lamp for Monitoring the Development of the Embryo. This is the simplest and easy to use Candler for dark eggs on the market today. It is highly recommended for farmers with less experience in egg candling. It is a brightly and very efficient product equipped with the LED ideal candling bulb. 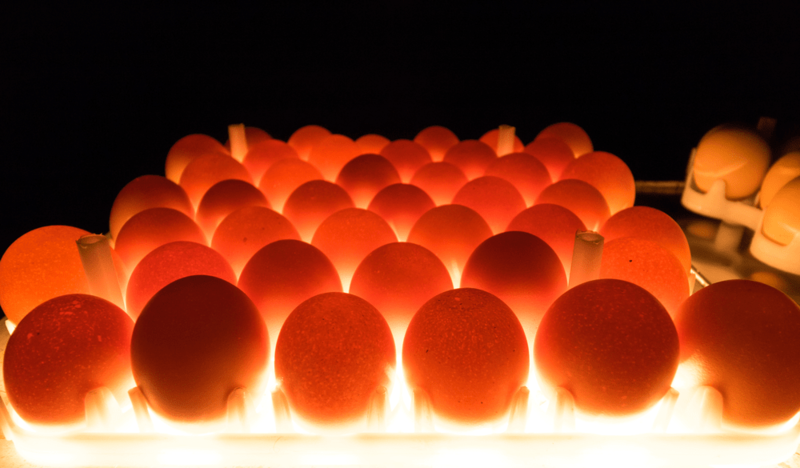 The light doesn’t emit heat; it is cool which means it will cause no damage to the eggs. It works on 4AA batteries that come together with the shipping package. For Highest Possible Visibility of the Growing Embryo inside the Egg – Suitable for Darker, Mottled or Thicker-shelled Eggs this is the most suitable egg candler to go for. This product has the highest score among poultry farmers; it is preferred because of its high light intensity. You will be able to see through the egg and even magnify what you see while rotating it even without touching the egg! Ovascope works with eggs according to their sizes. It is the real definition of a high technology egg Candler that connects into a webcam. Such high-quality features are what makes it the go-to for teachers who want to teach candling while demonstrating. This candler is suitable for all types both dark eggs and brown eggs and all egg sizes. It is one of the easy to use egg candlers one can ever own. This egg candler produces no heat. Hence, no damage is caused to the eggs. Another exciting factor is that you can use it to observe the eggs embryo with no obstructions at all. This model makes it one of the best candlers with high light intensity. It has a tester Portable Flashlight Incubator Warehouse Exclusive with Charger Adapter for Brooder Chicken Quail Poultry. This egg candler has a safe place for the positioning of the eggs. It is a good egg candler that does not cost a fortune. It is of good quality, safe and easy to use. It has an on and off button that is easy to operate. It works with cool light and high luminosity. Its electric cable is long enough to enable you to work freely and move around when possible. This candler is affordable and of high quality. Thi candler is suitable for both brown eggs and dark eggs. Why should I not candle so often? Egg candling can become a very addictive experience, one will always be tempted to go check the eggs so often, and this might damage your eggs. Since it is a fun and enjoyable experience, it is important to know why often egg candling cause danger to your eggs. If you candle your eggs so soon, you might end up discarding eggs that the embryo has no developed yet and assume that is infertile. It is advisable to candle the egg on the seventh day; this way the embryo will be easily seen if it’s there. No need to rush in anything, patient is important in this process. Some egg candlers are specially designed to turn the egg without the farmer touching it. If you keep on touching the egg in the name of candling, you might end up clogging the fragile air cells. This will cause great damage to the egg. No matter how gentle you try to be with the eggs, you will always end up detaching and blocking the air cells. It always advisable to hold the eggs using clean hands. Doing it so often, you might forget washing your hands before touching the eggs. Contaminated eggs hatch dead chicks or the egg might even burst while in the incubator. Whenever you smell a foul smell from the eggs, smell all eggs one by one and remove the bad one from the rest. You might feel the smell from a distance. This process is important. Eggs are super fragile, a slight hit on its shell and it becomes useless instantly. It is so sad if you drop an egg even when it was for cooking, imagine that feeling when the egg was destined to hatch. This gets worse when you drop the egg you were candling under the other eggs below it. The eggs might not break but, the air pores might block, or the egg will be contaminated. Such accidents cause huge damages and must be avoided as much as possible. You might lose the heat and humidity of your incubator. Keeping the heat and humidity of an incubator intact might be very tricky a number of times. Therefore, reduce the number of times you candle in turn reduce how many times you are in the incubator. This helps keep the humidity and heat intact. This is very important, regarding the fact that without paying much attention to it might damage all your eggs. What are Important things to note when egg candling? The first thing is to understand why you are candling in the first place. If you are candling from home, it is important to keep track on the embryo and general development of the eggs. When hatching eggs from home, it’s very rear to get 100% hatch success. Not all eggs will hatch. Some will be infertile; others will just get damaged. It is important to identify the yolkers and the quiltters earlier. If not, they will rot and burst inside the incubator. A candling equipment does not have to be fancy to bring the best results. In fact, back in the days as we earlier said they used candle flames. The main requirement is light with high intensity, a place to put the egg plus a dark room. You can use a flashlight, make your own egg candler or use any of the best reviewed candlers above. What procedure should you use? You should candle your eggs before putting them in the incubator. Probably you will not see anything, let alone being able to differentiate between the good and the bad eggs. It will also help to look for tiny cracks around the eggs shells. Cracked shells are more susceptible to bacteria, it will get inside and damage the embryo. If you find a cracked egg do not discard it yet, put a mark on it and monitor its progress. In general candling of eggs is done to determine the state of the air cells, the yolk, and albumen of the egg. Candling also helps you spot bloody albumens, meat spots, or even blood spots, and it allows observation of any germs that might be developing. Candling should be done in dark rooms with light flashed through the egg. The light passes through the eggs shell and lets you observe through the inside. The egg candler should be placed on top a table or a box at a height that is convenient and favors you 38-40 inches from the floor is advisable, this will not let the light shine into your eyes directly. In handling, the egg is held in a slanting position with the large end of the hole in the candler. The egg is then grasped or maintained by the sharp end, and while also held in between your thumb and the tips of your first two fingers, is turned quickly to the right or left. This lets the egg contents move and also moves the yolk nearer to the shell. Due to the color of their shells, brown eggs are harder to candle than white shelled eggs. So as to do work with good results, extensive knowledge of candling is not necessary, mainly if the eggs are all fresh. You should be able to differentiate a fresh egg from a stale one and detect such abnormalities as bloody whites, blood spots, meat spots, and cracked shells. In a fresh egg, the airspace is plainly visible and moves freely. The white is thin and clear. In a stale egg, the airspace is plainly visible and moves freely. The white is thin. Mostly newly laid eggs are often of high quality. Eggs that are not over two to three days old, if put under suitable conditions, will meet the specifications the best classification which is Grade A. the eggs that should be removed are the ones with meaty spots, blood spots or white spots on the shells. How do I candle incubated eggs? As discussed earlier, candling incubated eggs should be done with so much care. They are candled to determine if they are fertile and, if productive, to see and monitor growth and development of the eggs embryo. White eggs should be tested for productivity on the third day while brown shelled eggs should be tested on the fifth or sixth day because it is tricky to see the embryo clearly before this time. A small reddish area with blood vessels extending away from it will be visible in fertile eggs. This is the embryo floating around inside the egg, looking like a vast red spider. If the embryo dies, the blood draws away from the embryo and forms what is called a blood ring. All clear eggs and eggs showing blood rings or streaks should be removed from the incubator. If eggs aren’t candled during the early stages of incubation, it will be hard to determine whether the egg was fertile; embryos that die early soon decompose and are not easily differentiated from rotten eggs. Q; How often should I candle? A; the best time to candle is after 7 days. You should candle before putting the eggs in the incubator. Candling should not be done so often once in the incubator. At day 10 you should candle the ones you had first marked that might not be viable. This is hard to do but it has to be done. Q; Is egg candling necessary? A; You might assume that since your eggs are in the correct incubating environment, then egg candling is not needed. It is not good to rely on chance; you might lose a lot of money and time if you work with chance and approximations. Being optimistic is good, but being sure is even better. Furthermore, egg candling is a fun experience with so much learning involved. It makes you more familiar with the process. Q; Can I tell the fertility of an egg simply through candling? A; Yes, you can! Most people question about this fact. After 6-7 days the embryo should be well developed with veins attached to it. This is observed when you see a dot lines coming from the dot. Q; How much should I candle? A; Egg candling can be done at any time. However, the best time should be before incubation. Touching the eggs often assuming that you are candling might interfere with the development of the embryo. You can damage your eggs thinking that you are solving a problem! The moving and turning of the egg are quite limited to avoid damaging the egg. It is recommended to candle on the 5th or 6th day, but once the eggs are in the incubator, only do it to eggs that are worthwhile. Q; How should I position the eggs during candling? A; it is advised that during candling, the much more pointed side should be facing upwards. However, there are no limitations in which position or side the egg should be when candling. You can face it any side which you will be able to comfortably see clearly. Q; Is there a problem if I mark the candled eggs? A; There is no problem in marking the already candled eggs. However, the right marker is recommended. Desirably, pencil or crayon. Any other markers might penetrate through the egg and interfere with the embryos development, especially permanent markers. Marking also helps to see the growth progress. Especially during the last stages when it is hard to see what you marked. This allows the farmer to spot the mistakes, correct them and also improve where necessary so as to increase the hatchability of the eggs. Q; How do I know what I am looking for? If you are new to candling, no need to worry, candling is a simple and easy process. We have offer you with all the information you need to know while, before and after candling. What you need to avoid, everything to observe. If you have not understood feel free to seek for expert advice, and you will have the go ahead on the way forward. Success to a poultry farmer is determined with how sure they are with the hatching of their eggs. For 100% an egg candler is needed to be sure. For the best candling experience, you need the best egg candler that is comfortable for you. Moreover, care is also highly recommended for this process. Without care, you might end up damaging all your yield. If you have trouble understanding anything consult an expert for help or more information.